Stems rough and stiff. 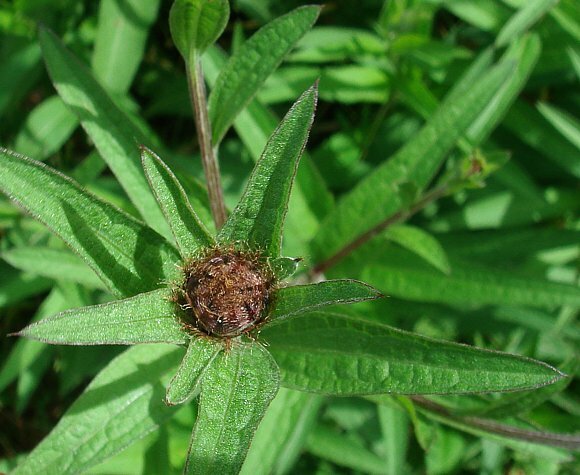 Stem leaves lanceolate rather than the branched linear of Greater Knapweed. 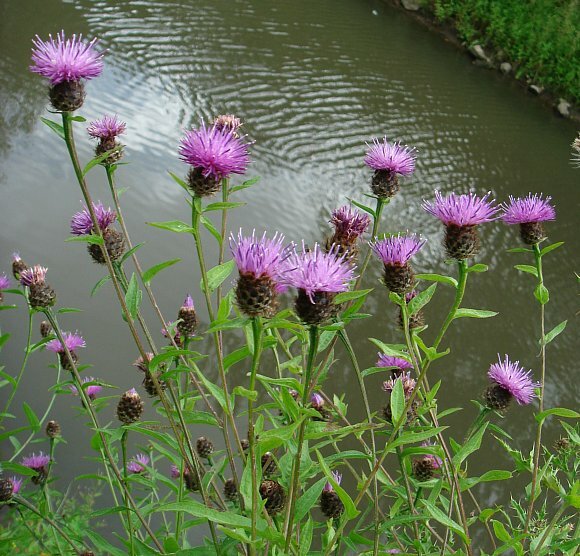 Thistle-like flowers similar to shaving brushes, but also frequently with rays (see photos below). Black 'heads' (actually flower buds) slightly non-spherical, with a slight neck at the top. 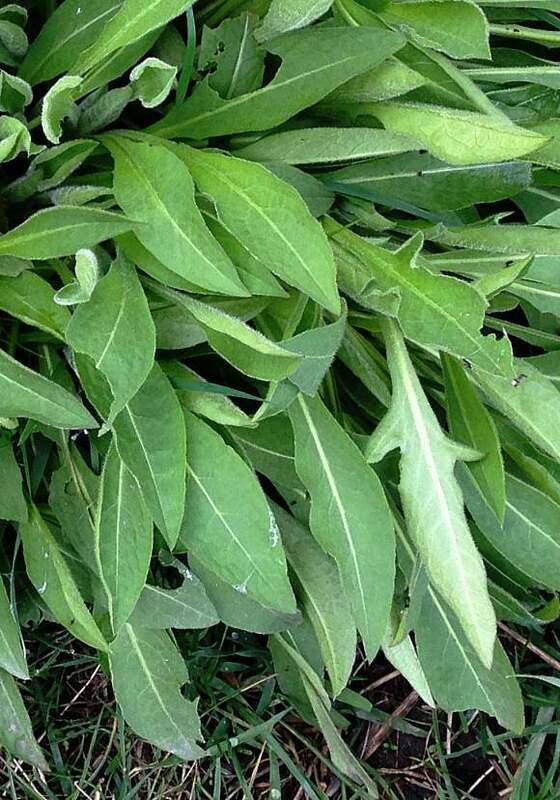 Both stem and leaves covered in very short rough hairs giving it a slightly greyish-green colour. 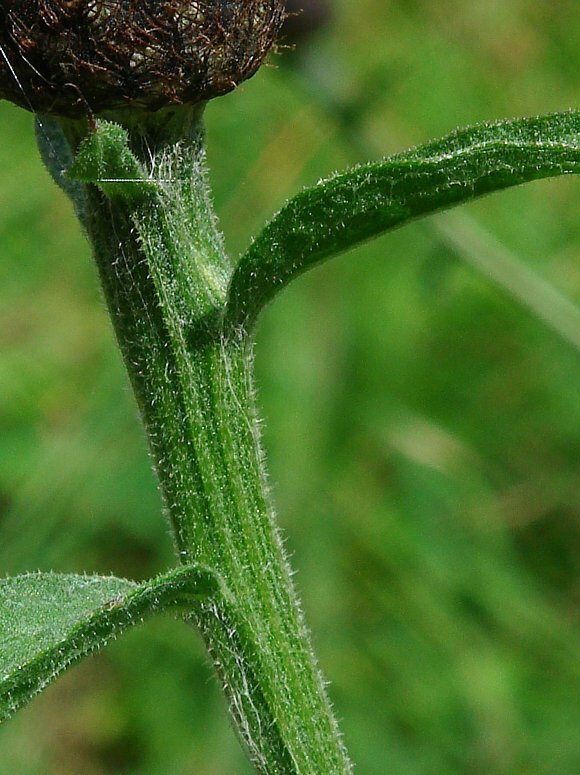 Stems markedly swollen at the top just below the black flower bud unlike that of Lesser Knapweed (now known as Chalk Knapweed (Centaurea debeauxii)). The purple-coloured longish disc-florets loosely bunched at the top. White pollen splatters the disc florets. The stem Leaves are without stalks and attach to the round and ribbed stem with a broad contact, up to half-way around the stem, but sometimes much less. Leaves mostly alternate up the stem. Stem and leaves covered in short rough hairs like stubble. Stem markedly swollen at top. The phyllaries are black and have longish strands at the top. Basal leaves. Lanceolate with winged stems. Basal leaves. Mealy and hairy with pronounced pale mid-rib. Sometimes sparsely lobed. Rayed versions are frequently encountered. The 'rays' are not ray-florets, but extended (and therefore tubular rather than flat) disc-florets with five deep cuts at the end resulting in five 'fingers'. Not to be semantically confused with: Common Centaury (Centaurium erythraea) nor with similar Centauries such as Seaside Centaury (Centaurium littorale) [plants whose scientific names are similar, but which are in a totally different Family altogether, the Gentian Family (Gentianaceae)]. 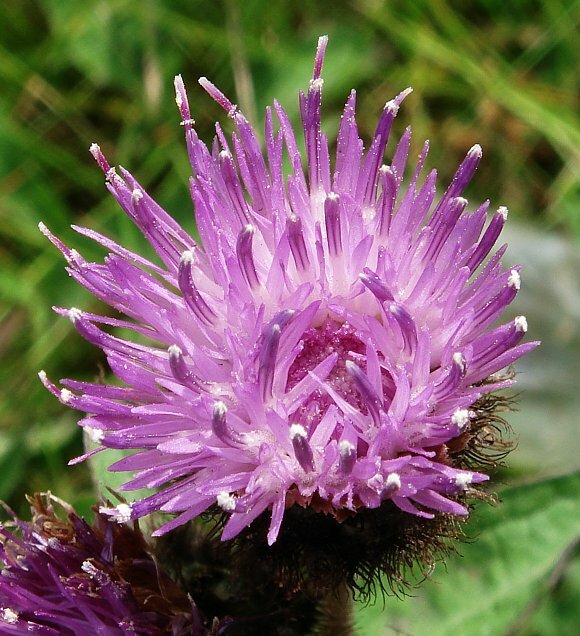 Easily mis-identified as : Lesser Knapweed, but see text below. 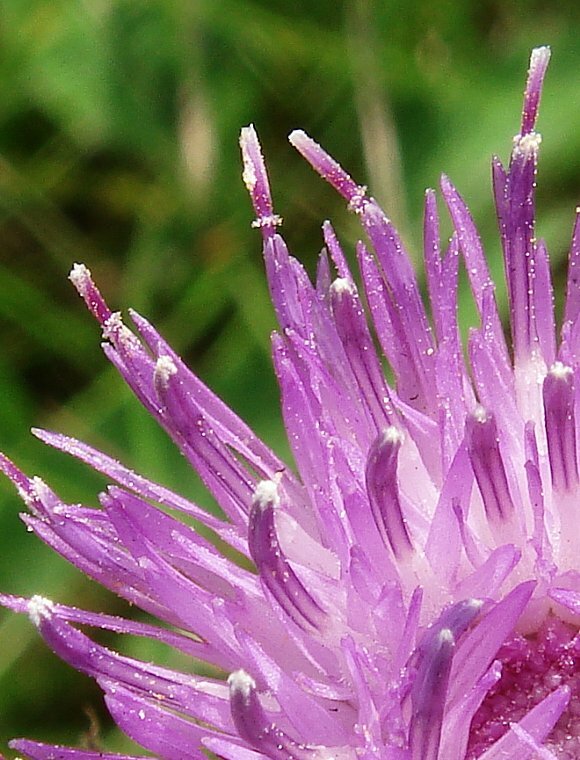 Possibly hybridizes with : Lesser Knapweed, but see text below. 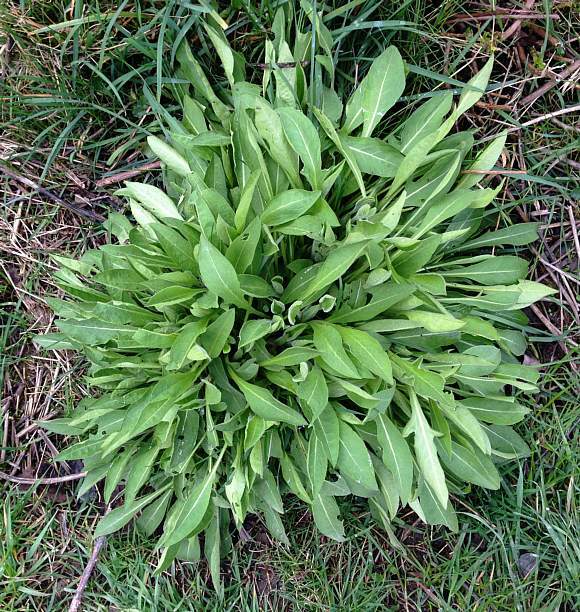 Not to be confused semantically with : Knotgrasses such as Knotgrass, Cornfield Knotgrass , Equal-leaved Knotgrass or Northern Knotgrass which belong to the Dock & Knotweed Family, namely Polygonium [they both have similar names]. Nor should they be confused with Knotweeds such as Giant Knotweed, Japanese Knotweed or Lesser Knotweed which also belong to the Dock & Knotweed Family (Polygonium). No relation to : Knotweeds or Knotgrasses [plants with similar name, see above]. 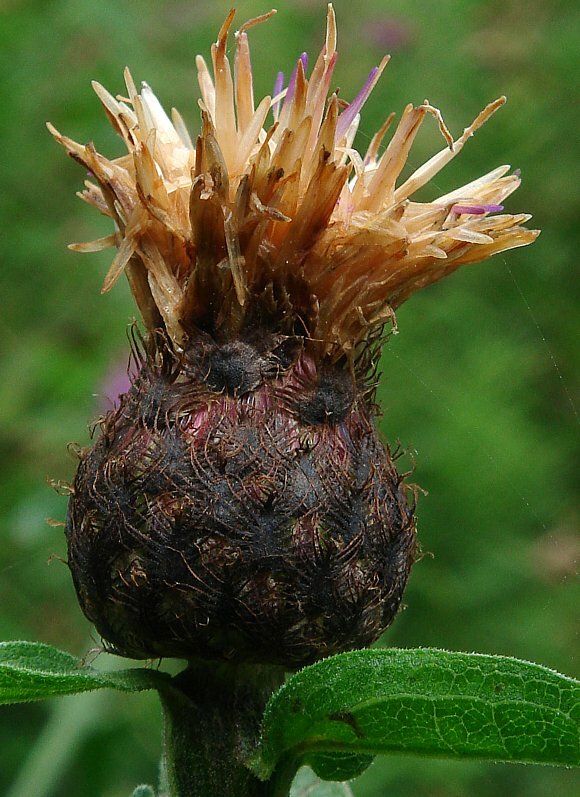 Common Knapweed is quite a confusing plant, although it doesn't 'seem' (but see below) to hybridize with other knapweeds, it has two or more forms besides the rayed and un-rayed versions shown above. 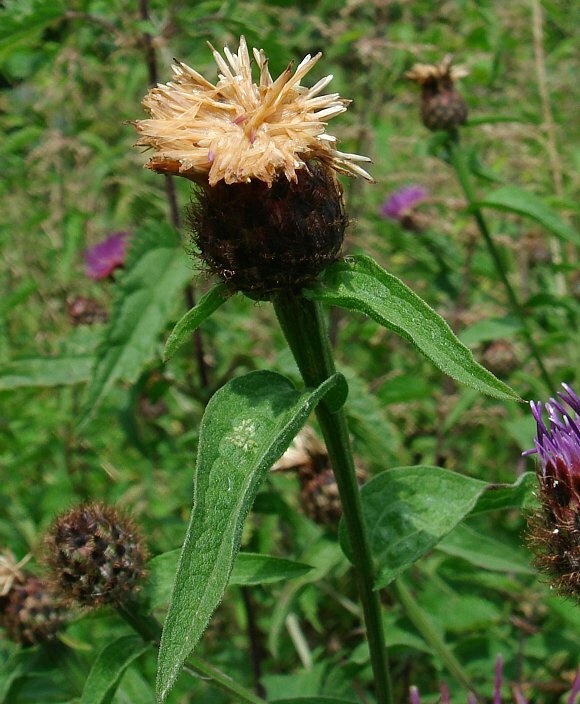 One of these is the slenderer and greener Lesser Knapweed with stems scarcely swollen at the base of the flowerhead. 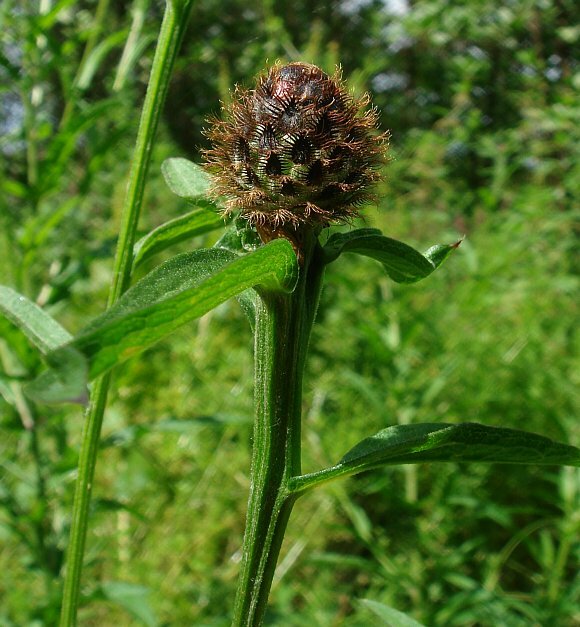 Many list Slender Knapweed as Centaurea nemoralis but this is not listed on the BSBI website (an oversight perhaps?). On the other hand, Mr. Clive Stace lists Lesser Knapweed as Centaurea nemoralis and lists Centaurea nemoralis as the older name for it, but whatever, Centaurea debeauxii is also not listed on the BSBI website either (2017 update - Centaurea debeauxii is now listed on the BSBI website - and has had a change of common name, with the common name Lesser Knapweed being replaced by Chalk Knapweed). 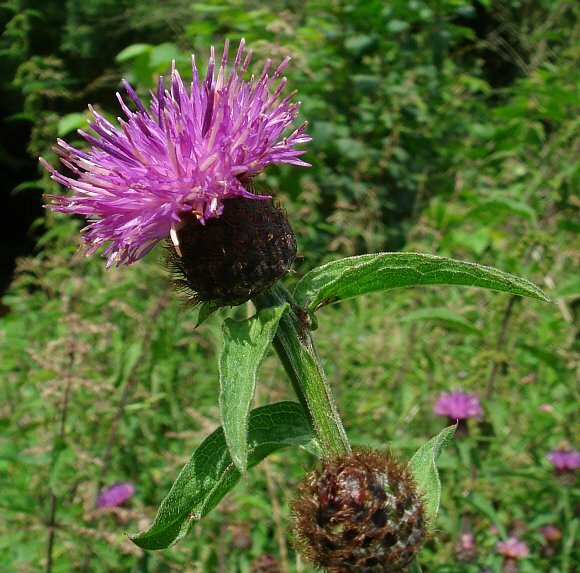 Common Knapweed has two subspecies: Centaurea nigra subsp. 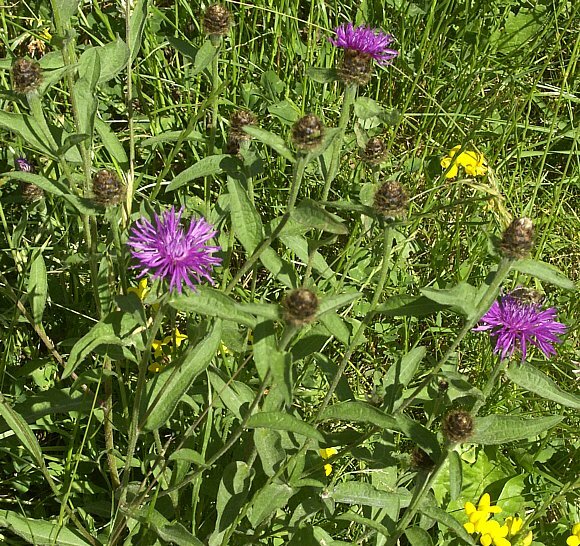 nigra ( Common Knapweed ) and Centaurea nigra subsp. 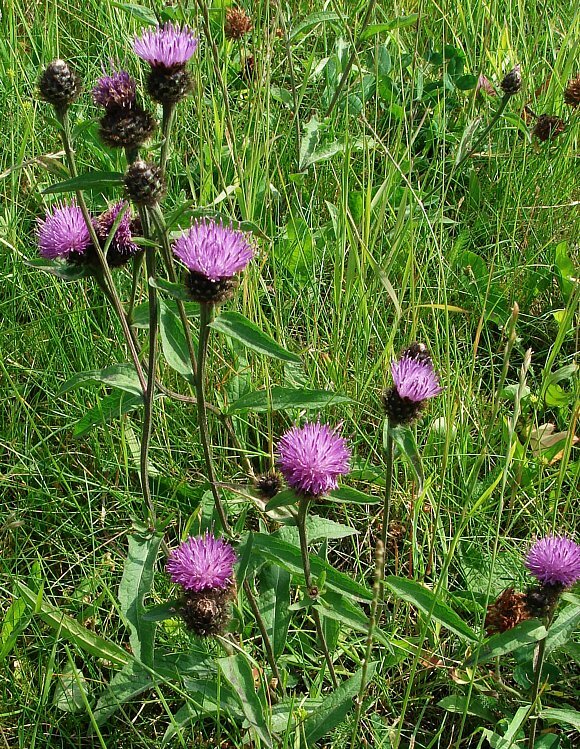 nemoralis (Lesser Knapweed. Intermediates occur where both subspecies grow together, or even without subsp. nemoralis. Tellingly, Mr Clive Stace lists Common Knapweed as hybridizing with Centaurea debeauxii (Lesser Knapweed) but goes on to say that intermediates are common and fully fertile between each other which he says hints that the two 'species' are not separate species. 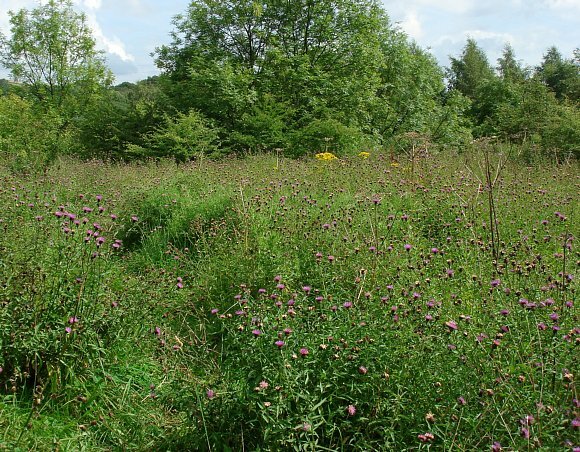 In which case, Common Knapweed/Lesser Knapweed is a single but very variable species. This WildFlowerWebsite lists the two separately so that the reader may see the 'difference' between perhaps the two extremes of the single range. This all makes Common Knapweed / Lesser Knapweed very confusing. Some geneticist may come along and sort it all out. 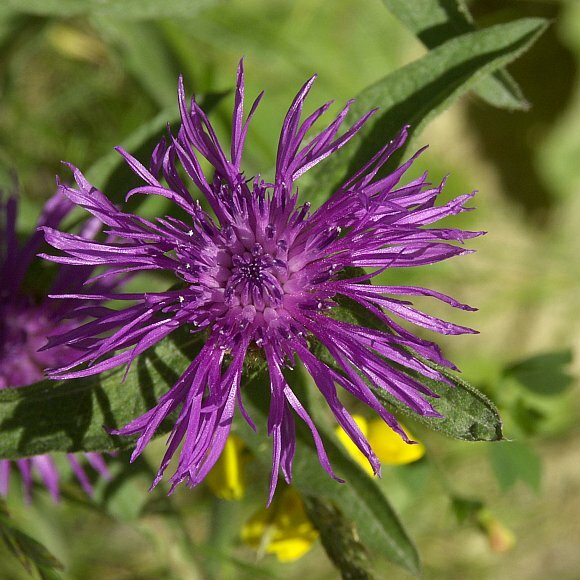 In the meantime, Lesser Knapweed (now known as Chalk Knapweed (Centaurea debeauxii)) will get a page to itself on this website. Grows in waste places and other rough ground.